Scroll down for descriptions of all workshops. Summer and Fall dates to be announced. Private instruction for individuals/groups also available. See below for all class descriptions and details. If cost prohibitive, any offering in sacred reciprocity is gratefully accepted. Bring something to place on the altar during the ceremony. If you wish, bring a poem, short reading or your words from your own heart, apropos to the Solstice season celebrations. Space fills up more quickly for the Solstices. Please reserve your spot well in advance. Welcome letter with more details and location given upon registration. 48 hour cancellation requested. Contact BJ at 303-808-4006 to reserve your spot. Native Americans are most welcome, no offering expected. * Any monetary offering for ceremony assists BJ's volunteer work for the Native American women in the Denver Women's Correctional Facility. ​ BJ is deeply devoted to being of service and advocacy for the offenders there. - Native American foods on feast days, ~ $350. - Treats (e.g. Tanka bars, chocolates, plantain chips...) twice a year, ~ $120. - Paper and ink for handouts on a weekly basis, ~ $150. ~ And other donations purchased from Native venders at Powwow, or Indian Market. Shamanism is an ancient, sacred methodology that is deeply rooted in most cultures around the world. Learning basic skills in Shamanic healing and divination can increase a sense of health, well being, clarity and wholeness. Such methods will be taught in this workshop to aid participants in their interior explorations of Self and Soul, and enhance their own spiritual autonomy and empowerment. I would be honored to be your shamanic teacher. A Welcome letter will be e mailed upon registration. It will include what you need for the workshop, cancelation policy, and address of workshop location. 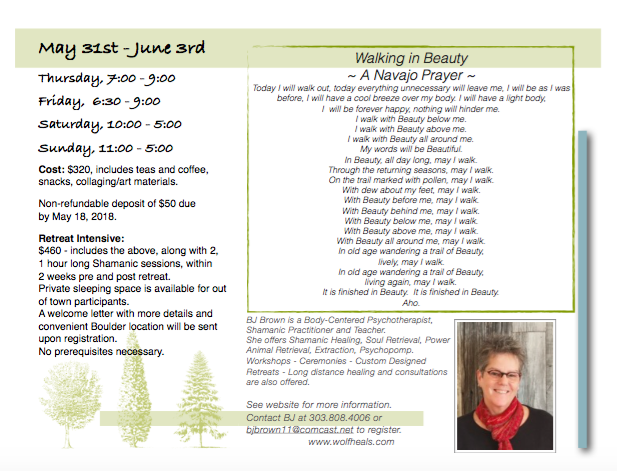 This class is designed to create greater connection to the rhythms and teachings of our own nature and the nature that is our Mother. We tend to separate ourselves from Nature, the self from the natural environment outside. We are Nature. Together we will increase our awareness, senses, and intuition to transmute toxic thoughts and beliefs affecting our own natural and environmental health and well being. This class is based on the course and book, Medicine for the Earth, by Sandra Ingerman. Early Registration Discount of $15 if paid in full by February 25th ($260). Convenient Boulder location given upon registration. Included: art supplies, snacks, coffee, tea. Bring: lunch, journal, eye covering, drum and rattle if you have them. Wear comfy clothing and good walking shoes. Basic skills in Shamanic journeying is required. Location: Boulder - details upon sign up. Fee: $95 for first time participant. Call 303.808.4006 to reserve your spot. In a day both restful and energizing, you will view a specially chosen, evocative film, allowing it to bring up the personal things your psyche is ready to reveal to you. The movies are framed with the magic of meditation, music, community, and deft facilitation by BJ Brown. This combination brings the power of the film to a new level, making of it a lucid dream ~ the psyche speaks and is heard. This is experience is unique among self-explorative ventures - it retains a lightness and pleasure in the day, even while deep soul work is being done together. There is no fee for this circle. Contact BJ to reserve your spot. Location provided at that time. Talking Circle creates a safe harbor for our own and each other’s courage, vulnerability, concerns and yearnings. We’ll witness, hold space, weep, laugh, seethe, express. As in Native American teachings, the Talking Circle can be a cleansing and profound, even replenishing experience. The Talking Circle will be conducted in a traditional way. A talking piece is passed, giving each person the opportunity to speak from the heart. There is no cross talk nor discussion. Compassionate presence, a willingness to listen deeply and to be heard is all that is needed. We are in unpredictable, unprecedented times. Many are experiencing ecological grief, deep bewilderment, anger, confusion...and some are deeply hopeful. The circle is here for you - a vessel for what wants rise and be expressed. 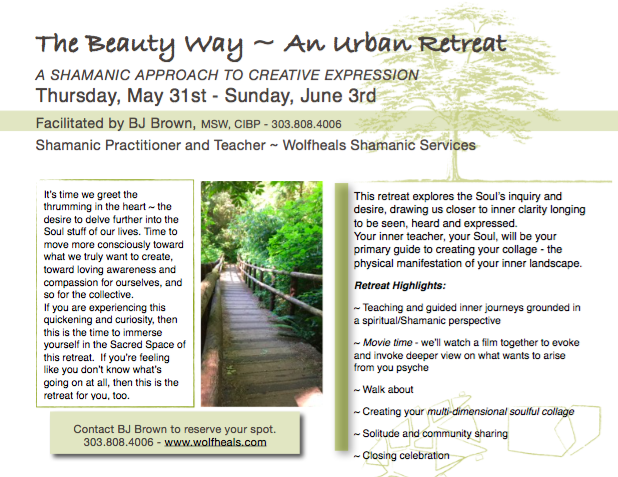 A Shamanic perspective on the rippling benefits of healing through your empowered intentions and radiant light, this workshop uniquely enhances your connection to self, Earth, your spirit helpers, and your own essence. $25 discount for early registration paid in full 10 days prior to workshop. Friday, 7-8:30, Saturday 10-5, Sunday 10-4. Please bring your journal, drums and rattles if you have them. Rattles available to borrow. Welcome letter with details available upon registration. For those interested in an ongoing shamanic journey circle, this facilitated group meets every third Sunday of the month. Members are notified by BJ of any changes due to quarterly ceremonies, illness, etc. Basic knowledge and experience in shamanic journeying is required to participate. Our circle provides long distance healing and divination work for family, friends, community members who have specifically requested our support.